My dear old dad made this hilarious birthday card for The Bean. Thanks for the laugh, Dad! That is precious!!! You have a wonderful dad!! Add '# of kittens served/licked' and it would be perfect! Clever runs in the family. This is fabulous. HA! Your Dad is fabulous! Oh this is fabulous! Stellar gifting!!!! What a fun and great idea!! What a great Dad! You have a very funny father. 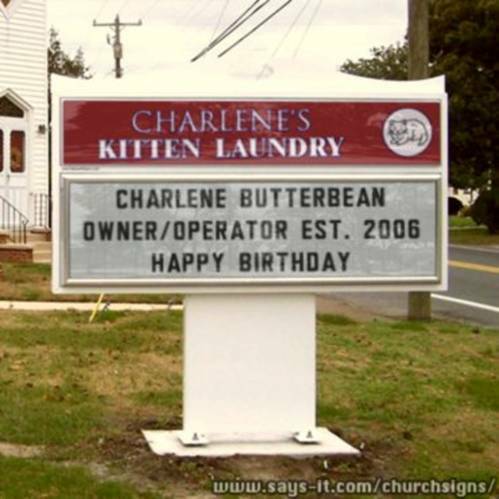 Belated happy b-day to Charlene. Laurie, between your Mom and your Dad, no wonder you turned out so spectaculary! Outrageousness! How he DO dat? Dad done good! What a great guy! Kitten Whisperer indeed!